Dr. Natasha Campbell-McBride is a medical doctor who graduated in Russia, and after practicing for five years as a Neurologist and three years as a Neurosurgeon she started a family and moved to the UK, where she got her second postgraduate degree in Human Nutrition. She is well known for developing a concept of GAPS (Gut And Psychology Syndrome), which she describes in her book Gut And Psychology Syndrome – Natural Treatment for Autism, ADHD, Dyslexia, Dyspraxia, Depression, and Schizophrenia. The GAPS diet was developed to naturally treat chronic inflammatory conditions in the digestive tract as a result of a damaged gut lining. Through years of research and clinical experience, Dr. Natasha Campbell-McBride adjusted her protocol to fit the needs of her patients suffering from a variety of intestinal and neurological conditions as a result of an imbalanced bacterial ecosystem within the GI tract. The GAPS Diet focuses on removing foods that are difficult to digest and damaging to gut flora and replacing them with nutrient-dense foods to give the intestinal lining a chance to heal and seal. 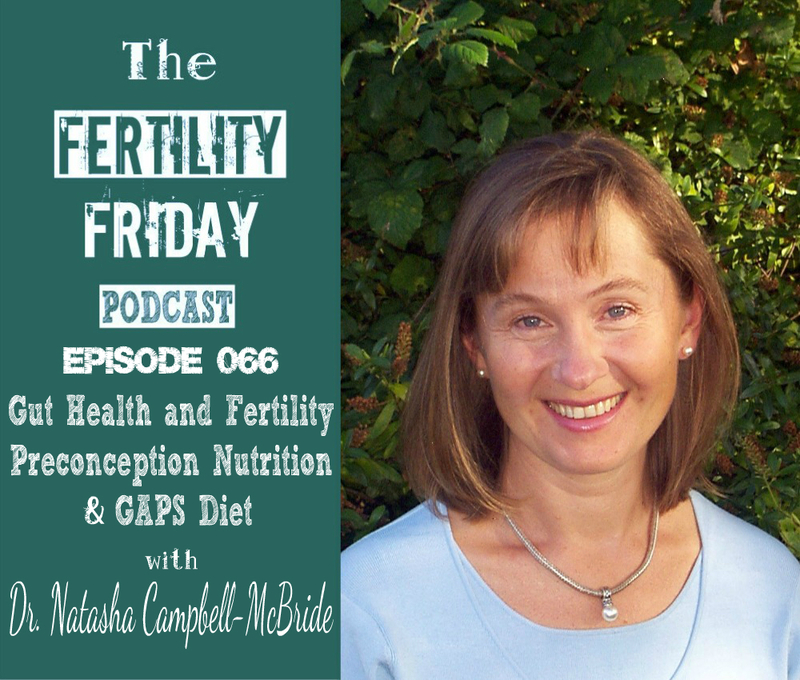 In my interview with Dr. Natasha, we talk about the importance of gut health for fertility, pregnancy as well as the important role that gut health plays in the health of your children! What is the connection between the hormonal health and gut health? How do antibiotics impact gut flora? What impact do hormonal contraceptives have on gut flora? The relationship between abnormal gut flora and illnesses such as Autism, ADHD, allergies, food sensitivities, eczema, asthma, etc. The best episode of all since starting learning more about fertility! Congratulations and thank you! I enjoyed this episode, though am a bit skeptical of a few things she says, and not a fan of dogmatism. She states very firmly that the egg only lives 2 hours, and sperm 2 days, which makes me question the strength of her other facts. It must be hard not to correct guests on the podcast when they get fertility facts wrong, or confuse FAM with Rhythm! Hi Caitlin, the thing is that unless a person has studied fertility awareness specifically they will not necessarily be an expert in that area. Just like a neurosurgeon wouldn’t necessarily be an expert on acupuncture. It doesn’t negate the validity of their knowledge base. I think her overall point was just that the egg only lives for a short period of time, and sperm also only live for a few days, so women should consider birth control options with that in mind. Since women aren’t fertile 100% of the time, is it really necessary to choose a birth control that provides 24/7 protection? Hopefully you were able to zoom the lens back and see the bigger picture of what she was trying to get across! Very compelling interview. What struck me most was the toxic release into the first pregnancy causing miscarriage. Can that really be true? Several friends of mine and myself included have had their first pregnancy end in miscarriage. I’ve been trying to get pregnant for 9 months since then and came across the podcasts as a result. I’m so thankful I have because I’ve learned SO much as a result. I thought I was healthy and “aware” of my cycles before but there was a lot i didn’t know and could do to be healthier. I’ve adopted a lot of the advice from previous interviewees (BBT charting, making kefir, broth, folate, sauerkraut (though unsuccessfully so far lol) etc). I hope to then be better off when i conceive again. Still haven’t got my head around the raw milk though… I’m a Canadian living in the UK and have found a source of raw milk from a regularly inspected farm that sells it legally and is award winning. Had my first liter last week (I survived) and have ordered more, but don’t know if i would dare continue once i get pregnant again….. Maybe making kefir/yogurt at home from whole organic pasteurized milk can be as effective???? Hi Bridgitte, Thank you so much! I’m glad you’ve been enjoying the show! Try making kefir with the raw milk! It might hep you to feel more comfortable with it! The more I learn about pasteurized milk the more I want to stay away from it! But just use the best milk you can find or that you feel comfortable with. Drinking organic pasteurized milk isn’t ideal in my opinion, but if you make kefir with it at least you are getting the benefits of the beneficial bacteria. This was eye-opening! It made so much sense and sparked a desire in me to be much more conscious of what I put in my body. Thank you for continuing to do what you do. Be blessed! Listening to this podcast was very frustrating to me. I was excited to learn more about gut health, but found myself turning it off halfway through when she started saying any non-animal fats weren’t beneficial to you. I think most everyone can agree that avocados, nuts, and coconut oil are all quite healthy. It was also hard to believe that you miscarry the first few babies because you just dump your toxic load into them. Pregnancy may mobilize stores that weren’t otherwise in your bloodstream, but miscarriage is also likely due to imperfect genetic match or implantation, or perhaps to the MTFHR mutation. And we all know people who get pregnant on the first try who probably aren’t the healthiest. Babies are bathing in toxins in the amniotic fluid due to the toxic environment we live in. Why is it that some make it and others don’t? It is likely due to something else! How awful it must be for a woman with fertility issues to hear that it is her own body that is so toxic it’s killing her first couple of babies. Today I decided to give the episode another try, and again, found myself frustrated and even laughing at some of what she was saying. Saying that the reason cows produce so much milk is due to brain tumors and that they don’t live very long? Cows produce milk because they are repeatedly impregnated and, sadly, still live a long, usually miserable life. It is completely false that raw milk contains the lactase enzyme and that that is why it is tolerable to some lactose-intolerant people. Lactase is produced in the gut and humans will stop making it in childhood unless they continue to consume dairy. Raw milk may contain bacteria that possibly stimulates the production of lactase in the gut, however, the milk itself doesn’t contain it. If milk contained lactose plus the enzyme that digests it, would there be any lactose left? On another note, we can in fact digest plant protein. Animal is touted as the better protein since it is complete, and while that may be true, we can definitely digest plant protein into their amino acids and can create a complete protein by bringing together complementary foods. The body produces all of the cholesterol it needs to live. She states the importance of consuming it is due to the vast uses in the body, however, it is very clear in medical literature that we do not need to consume it (not saying we shouldn’t eat it at all) and when people move toward plant based diets, their cholesterol does drop which suggests that intake does play a role. Lastly, when asked about fertility, she states that the egg lives for 2 hours and sperm lives for 2 days. Again, not true. Perhaps you could have kindly corrected her misinformation? I saw above that you had hoped another commenter could see the big picture and that we shouldn’t expect people who aren’t experts in the fertility field to know the exact science. My frustration comes from the fact that throughout the entire interview, she speaks with such conviction that a lot of people may believe that everything she is saying is fact. Not everyone will look at the big picture, in fact, some people may take these interviews as gospel and apply them to their lives without doing any research of their own. And perhaps spread misinformation to their friends and family. With such claims, she needs to provide resources to back them up. I hope that she has them in her book. Maybe in the future if they’re going to reference studies, they could provide the study information so that we can do our own research and feel confident in what they’re saying. I felt like the entire podcast was about her recommended diet. Unfortunately, I cannot feel confident in much of what she has stated. I do otherwise enjoy the podcasts, just not this one. Thank you for sharing your perspective Marilyn. I am very happy to have had the opportunity to interview Dr. Natasha. The important takeaways from her interview are how important gut health is for fertility, conception and having healthy children. The best thing we can all do is strive to be aware of this and try to improve our gut health to the best of our ability. I hope that the overall message came through. Really interesting comments from Marilyn. Dr. Natasha does speak with such conviction that I think one can easily get swept up in what she is saying. Some of the details and facts might be incorrect or questionable which does undermine her credibility. I appreciate the other perspectives from your post Marilyn. I think what we can take away from this discussion and with other interviews as well that there is an overall interest in achieving optimal health and we all need to make our own informed decisions. Through this journey of trying to get pregnant I’ve heard so many arguments for doing this or that with equal amounts of counter arguments saying you shouldn’t! So, it can be so confusing to know what’s right. I love these podcasts because it has opened my eyes to all kinds of new perspectives that I hadn’t heard of. I really enjoyed this interview and the spark/controversy it stirs up. Thanks for providing this platform Lisa! One of the best episodes to date! Absolutely loved Dr Natasha’s perspective on gut health and what can be done to heal the gut and live the life to the fullest (not keep avoiding some types of foods for life because we have been diagnosed as possibly allergic to those). Dr Natasha is very black and white in her opinions but you take out what you think is relevant for you and there is plenty of information provided in this podcast to choose from. Thank you Lisa for your work! Thanks so much Tatiana! So glad you enjoyed this episode! My mind is blown! I am going to read her books!